In order to fully understand the story of Our Lady of Mount Carmel, we must explore all the events leading up to this event. First of all, Carmel is located in NW Israel near Haifa. "Carmel was the dwelling place of the first and greatest Jewish prophet, Elijah, who lived there in a cave in the ninth century B.C., and defeated the pagan prophets of Baal" (Mullen, 104). Elijah had a vision of the Blessed Virgin which inspired the Christian Carmelite Orders. The Carmelites have worshipped here since the twelfth century. The Lady Mary was brought to the Cave of Elijah by her parents, Anne and Joachim, when she was a girl. The Lord Jesus also took refuge in the Cave of Elijah with Mary and Joseph when they were returning to Nazareth after their flight into Egypt. The Carmelites were an example of the hermit tradition. They lived a life of solitude and prayer in sacred locations in the Holy Lands. The traditional robe of the Carmelites was the white mantle and they were often referred to as the "White Friars" (Mullen, 80). The Carmelites observed a strict rule about abstinence from meat and a feast that lasted from September 14th (The Feast of the Exaltation of the Cross).until Easter. During the Crusades, life in the Middle East was dangerous, so the Carmelites left their monastary and settled in various places in the West: in Cyrus, Messina, Marseilles, Genoa, and Aylesford, in England. Those that remained in the Middle East were massacred by Al-Ashraf Khalil (a Muslim leader), on July 30, 1291. Apparel later was a brown habit with the brown scapular of the Order and a white overmantle. Simon was born in Kent, England; and he died May 16, 1265. When Simon was twelve years of age, he retired into the wilderness and dwelt in a great hollow oak tree. This act gave Simon the surname "Stock," meaning "tree trunk." Simon drank only water and ate nothing but herbs, roots, and wild apples. Simon was introduced to some religious men from Palestine who came to Aylesford, England, to their Carmelite monastery (located near Rochester, in Kent). These men arrived in 1205, by invitation of John Lord Vescey and Richard Lord Gray of Codnor. After a brief visit, they returned to the Holy Lands. Simon was greatly affected with the devotion of these men, as servants of God and the Blessed Virgin. In 1212, he joined their holy company, and studied at Oxford University. In 1215, Brocard, prior of Mt. Carmel, and general of the order, appointed Simon vicar-general with full power over the western provinces. At this time, there was a clamor against this institute. Simon went to Rome, in 1226, and received a confirmation of the rule given to the Order by Pope Honorius II. In 1229, this was given a second time by Pope Gregory IX. Some years later, Simon visited Mt. Carmel and lived in Palestine for six years. In 1237, Simon acquainted himself with the general chapter of the Order held by Alanus, the fifth general. The Order was then being threatened by the Saracens, so in 1240, they went to England. In 1241/2 Simon joined the Carmelite Order founded in Palestine. Then in 1244, Alanus himself left and met Simon and Hilarion (Simon's vicar) and they erected five monasteries on the island. The general chapter, of the Carmelite Order,was at Aylesford in 1245. Simon was made the sixth superior-general, and Pope Innocent IV gave him a new confirmation. By 1251, his branch, of the Carmelites, was under the protection of the Holy See. Simon was promoted to general and he then instituted the confraternity of the brown Scapular. Simon was admonished by the Virgin Mary, in a vision, on July 16, 1251, in Cambridge, England, this was a dark time for Catholics and the Carmelites were being opposed. At this time she told Simon to establish this devotion. This confraternity was approved and favored by many popes. The rules say, without any obligation or precept, that the members wear a little scapular, secretly, as the symbol of their order. They were to recite, every day, the office of Our Lady, or the office of the Church. If this was not possible, then they were to read, seven times, the Pater, Ave, and Gloria Patri, in lieu of the seven canonical hours.. They were also to abstain from flesh meats on Wednesday, Friday, and Saturday, or if this was not possible; then they would double, for these days, the seven Paters, etc. One belief is that whomever dies wearing the Carmelite scapular will have his soul released from pugatory the following Sunday ("Sabbath Indulgence"). St. Simon cured several sick people by giving them the scapular. These acts brought King Edward I, of England, and St. Louis of France into this confraternity. St. Simon governed the order for twenty years. He wrote several hymns and decrees for the order. At age 100, Simon sailed to Bordeaux, France. He died there on the May 16, 1265. He was buried in the Bordeaux Cathedral; and was made a saint shortly after his death. The Holy See approved the cult of St. Simon in Bordeaux in 1435, in Ireland and Scotland in 1458, and for the Carmelite Order in 1564. St. Simon Stock's feast day is May 16th. In 1631, the Spanish monk Prosper of the Holy Spirit was given permission to rebuild the monastery in Israel. In November 1631, Proper celebrated Mass in the Cave of Our Lady. In 1799, duing the Napoleonic Wars, the monastery was seized by the French, and used as a military hospital. Then in June 1836, a new church was dedicated. During World War One (I) the Turks expelled the monks. German and Muslims troops were stationed at the monastery and the monks were allowed to live there. In September 1918, Australian troops liberated the monastery. Then, before World War Two (II) the British army was there. The friars took refugees in, from Haifa and surrounding areas. By 1948, the Israeli army took over Mount Carmel. Then finally, in 1959, the American Secretary of State, John Foster Dulles, appealed to the Israelis to return the monastery to the Carmelites. The statue of the Blessed Virgin in their monastery church was carved by Giovanni Baptista Garaventa, a Genoese sculptor, in 1820. On July 15th, the Festival of Our Lady of Mount Carmel is celebrated there, and on July 20th, a service is held in the memory of Elijah in his grotto. There are many different legends regarding Mount Carmel and the Carmelites. This is just a sampling. In the year of Our Lord 1608 (16 February 1608, Papal Bull Romanus Potifex), a new order of chivalry, Our Lady of Mount Carmel, was created in France, and later that same year,in a political move, a Royal French Letters Patent was signed and sealed on October 31, 1608. "The Royal and Military Orders of Our Lady of Mount Carmel and Saint Lazarus of Jerusalem United." This act placed the Order firmly under the favour of the French Royal Family. The plith of the Order of Our Lady of Mount Carmel features the Blessed Virgin handing down the Rosary beads to Simon Stock as the centerpiece of the neck-badge and decorations of the modern Order of Saint Lazarus. 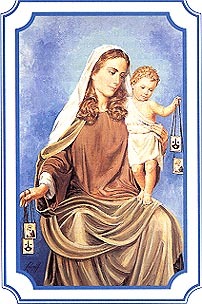 The feast of Our Lady of Mount Carmel was assigned to July 16th, because, on that date in 1251, according to Carmelite traditions, the scapular was given by the Blessed Virgin to St. Simon Stock; it was first approved by Sixtus V in 1587. After Cardinal Bellarmine had examined the Carmelite traditions in 1609, it was declared the patron feast of the Order, and is now celebrated in the Carmelite calendar as a major double of the first class with a vigil and a privileged octave (like the octave of Epiphany, admitting only a double of the first class) under the title "Commemoratio solemnis B.V.M. de Monte Carmelo." By a privilege given by Clement X in 1672, some Carmelite monasteries keep the feast on the Sunday after July 16th, or on some other Sunday in July. In the seventeenth century the feast was adopted by several dioceses in the south of Italy, although its celebration, was prohibited, in 1628, by a decree contra abusus. On November 21, 1674, Clement X granted this to Spain and its colonies, in 1675 to Austria, in 1679 to Portugal and its colonies, and in 1725, to the Papal States of the Church. And on September 24, 1726, it was extended to the entire Latin Church by Benedict XIII. The lessons contain the legend of the scapular; the promise of Sabbatine privilege was inserted into the lessons by Pope Paul V around 1614. The Greeks of southern Italy and the Catholic Chaldeans have adopted this feast of the "Vestment of the Blessed Virgin Mary." The object of this feast is the special predilection of Mary who profess themselves as her servant by wearing her scapular. Butler's Lives of the Saints on CD-ROM, Harmony Media, Inc, 2000. Jockle, Clemens. Encyclopedia of Saints. London: Alpine Fine Arts Collection (UK) Ltd., 1995, 409. Mullen, Peter. Shrines of Our Lady: A guide to fifty of the world's most famous Marian shrines New York: St. Martin's Press, 1998, 80, 104-105.